Upper Midwest KFC Franchisee Association recognizes Restaurant Technologies for long-term support and service. 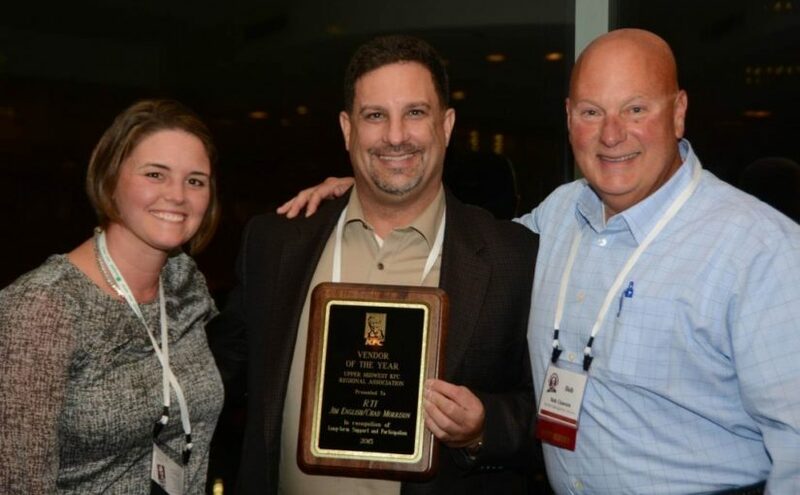 MINNEAPOLIS – October 28, 2015 ‒ The Upper Midwest Kentucky Fried Chicken (“KFC”) Franchisee Association presented Restaurant Technologies with the 2015 Vendor of the Year award at its Fall Super Regional Meeting in Denver, Colo. Currently 1,201 KFC locations throughout the United States are installed with Restaurant Technologies’ automated oil management system. The Upper Midwest region is one of seven domestic regions that make up the Association of Kentucky Fried Chicken Franchisees Inc. (AKFCF); Restaurant Technologies has provided support to this region since 2005. The award recognizes Restaurant Technologies for its excellent support and service that enable KFC franchisees across the region to improve food quality and efficiency. KFC is famous worldwide for its finger lickin’ good fried chicken, and has a cook in every kitchen freshly preparing meals each day. Therefore, an innovative oil management system takes priority in KFC back-of-house operations to ensure not only the quality of food consumers expect, but also promote the safety of KFC employees and cleanliness of KFC dining floors. KFC turned to Restaurant Technologies, which streamlined the receipt, storage, handling and disposal of frying oil through an innovative solution, alleviating KFC employees from the dangerous and time-consuming duty of transferring cooking oil. A trusted partner for more than 15 years, Restaurant Technologies is the leading provider of cooking-oil management to more than 22,000 national quick-serve and full-service restaurant chains, independent operators, grocery delis, hotels, casinos, universities and hospitals. Restaurant Technologies helps food service operators make their kitchens safer, smarter, more efficient and more sustainable through its automated oil storage, handling, filtration monitoring and disposal management system. Headquartered in Mendota Heights, Minn., Restaurant Technologies is a privately held company, currently operates 40 depots and has more than 750 employees serving customers across the United States.